By LUDWIG VON KOOPA - Ready for round 4 of the Splatoon Global Testfire? Public service announcement: The Splatoon Global Testfire will continue, for the last time, tomorrow (SATURDAY, May 23) at 3 PM Pacific, 6 PM Eastern. For one hour. If you want my impressions of the first three hours of the Splatoon Global Testfire, check 'em out here. Anyway, I'm totally caught up in Splatoon hype, so you can see my avatar is Squidwig. I'm A SQUID NOW. ...I'M A KID NOW. That's from a Nintendo commercial that you can check out here. It's important you're familiar with it since that's what the rest of this article is based off of! A lot of people dislike the commercial for unknown reasons, to the point that Nintendo disabled comments on the video. (Comments are still available on the other Splatoon video materials on their YouTube channel.) I personally love it. So I made three different versions of it, found below the page break! Want to dwell in all the ink? Actually, "Squid Kid" slowed down sounds really cool. If you want to grow up to become a demon Kraken, then listen to "Squid Kid" in G MAJOR! You can get the set of lyrics in the YouTube description for any of those videos... or right here. Rise up off the ink! Rated Everyone ten and up!" While I was making those videos, I realised how brilliant the video is to the song. 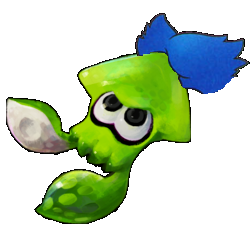 Every time the Inkling goes to become a squid, they're a squid. When they're humanoid, they're a kid. The song matches the action at all times and it's pretty nicely made. Of course, the video as a whole shows off a lot of what's so intuitively fun about Splatoon: How fun it is to change between forms and some of the implications of that design decision. In fact, you can read about that in the Splatoon Iwata Asks interview here. That's where the Rabbit and the weird squid-human pictures came from, too. The 65x65 avatar's background colours are the shades of ink from the actual game. So yeah, I'll have a lot of fun being Squidwig this Saturday. I hope you join me. And I'll be picking up Splatoon Day One when it comes out next week on May 29. And that's what I'll be writing about, unless George Zimmerman gets in the news again or something. What an article-attention-stealing jerk. Ludwig's NNID is PrinceOfKoopas, so if you want to play him in Splatoon, friend him on your Wii U. His Mii's name is Ludwig, so maybe you'll even see him in the Splatoon Global Testfire. You'll know for sure by going to the "People You've Played With" section of your Wii U friends application after the event. Squidwig returns May 29, as promised. Ludwig got the game day 1!